AN AUSPICIOUS START FOR SURIYA AND TEAM! 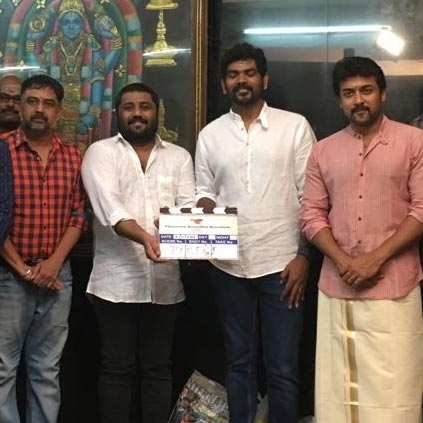 Suriya-Keerthy Suresh's Thaanaa Serndha Koottam officially goes on floors today (2nd November) with a small pooja which was held at an Ayyapan temple in Chennai. The makers are apparently planning to commence the shoot in a week's time. Soodhu Kavvum and Thegidi fame Dinesh Krishnan has been roped in to handle the cinematography department while Anirudh takes care of the tunes for this film produced by Gnanavel Raja’s Studio Green production house and directed by Vignesh Shivn. Thaanaa Serndha Koottam is expected to release for summer 2017. People looking for online information on Keerthy Suresh, Suriya, Thaanaa Serndha Koottam will find this news story useful.